Apples and Walnut Salad, healthy fall desserts from Thyme for Cooking. 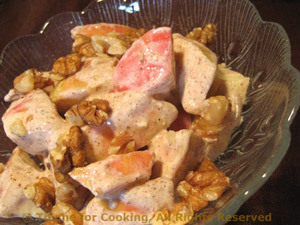 Perfect salad / dessert for fall or winter with my two favorite fall tree fruits: apples and walnuts. In medium bowl combine yogurt, sugar and spices. Stir well. Quarter apples and remove core. Cut into small chunks and add to yogurt and stir well to combine and coat apples. To serve, divide apples between 2 bowls and sprinkle with walnuts.